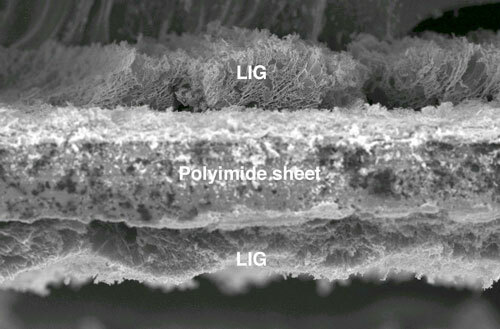 (Nanowerk News) Rice University scientists advanced their recent development of laser-induced graphene (LIG) by producing and testing stacked, three-dimensional supercapacitors, energy-storage devices that are important for portable, flexible electronics. The Rice lab of chemist James Tour discovered last year that firing a laser at an inexpensive polymer burned off other elements and left a film of porous graphene, the much-studied atom-thick lattice of carbon. The researchers viewed the porous, conductive material as a perfect electrode for supercapacitors or electronic circuits. To prove it, members of the Tour group have since extended their work to make vertically aligned supercapacitors with laser-induced graphene on both sides of a polymer sheet. 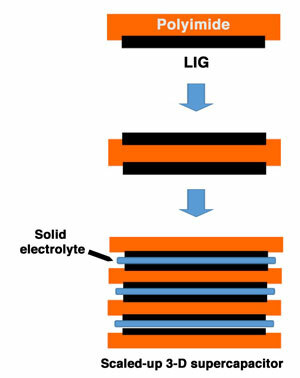 The sections are then stacked with solid electrolytes in between for a multilayer sandwich with multiple microsupercapacitors. The flexible stacks show excellent energy-storage capacity and power potential and can be scaled up for commercial applications. LIG can be made in air at ambient temperature, perhaps in industrial quantities through roll-to-roll processes, Tour said. The research was reported this week in Applied Materials and Interfaces ("Flexible and Stackable Laser Induced Graphene Supercapacitors"). Capacitors use an electrostatic charge to store energy they can release quickly, to a camera’s flash, for example. Unlike chemical-based rechargeable batteries, capacitors charge fast and release all their energy at once when triggered. But chemical batteries hold far more energy. Supercapacitors combine useful qualities of both – the fast charge/discharge of capacitors and high-energy capacity of batteries – into one package. LIG supercapacitors appear able to do all that with the added benefits of flexibility and scalability. The flexibility ensures they can easily conform to varied packages – they can be rolled within a cylinder, for instance – without giving up any of the device’s performance. “What we’ve made are comparable to microsupercapacitors being commercialized now, but our ability to put devices into a 3-D configuration allows us to pack a lot of them into a very small area,” Tour said. “We simply stack them up. Ripples, wrinkles and sub-10-nanometer pores in the surface and atomic-level imperfections give LIG its ability to store a lot of energy. But the graphene retains its ability to move electrons quickly and gives it the quick charge-and-release characteristics of a supercapacitor. In testing, the researchers charged and discharged the devices for thousands of cycles with almost no loss of capacitance. To show how well their supercapacitors scale up for applications, the researchers wired pairs of each variety of device in serial and parallel. As expected, they found the serial devices delivered double the working voltage, while the parallels doubled the discharge time at the same current density. The vertical supercapacitors showed almost no change in electrical performance when flexed, even after 8,000 bending cycles. Tour said that while thin-film lithium ion batteries are able to store more energy, LIG supercapacitors of the same size offer three times the performance in power (the speed at which energy flows). And the LIG devices can easily scale up for increased capacity. “We’ve demonstrated that these are going to be excellent components of the flexible electronics that will soon be embedded in clothing and consumer goods,” he said.